And as far as meat goes, the options here are pretty outstanding. 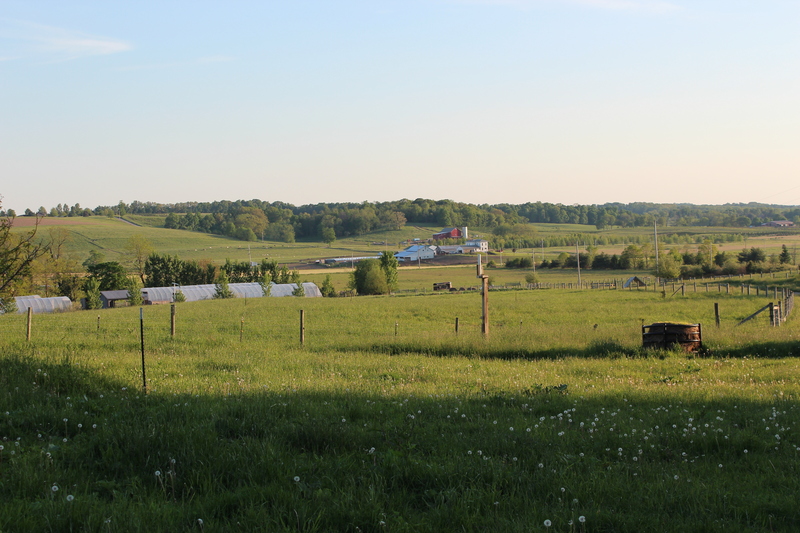 Our favorite is Fox Hollow Farms, a family farm that raises lamb, chicken, beef and pork in a setting that is so picturesque you have to remind yourself why you don’t want to trade places with any of the animals. Here’s a shot from one of our recent visits to the Farm in early summer. Don’t get me wrong, we loved Marin Sun Farms back in the Bay Area, but at practically $30 a chicken it just wasn’t sustainable for us. Here we get much of the same quality without the high prices and pretentiousness that (sometimes) follows. But one thing I miss terribly about the Bay is the fish and seafood. Whether it was our annual Dungeness crab party for Ryan’s birthday or the six different types of Salmon to choose from at Berkeley Bowl, we were definitely spoiled. Having never lived in a completely landlocked place, I had no idea how grim the fish options could be. So on the rare occasion when our local grocery store sells wild coho salmon, I buy it. 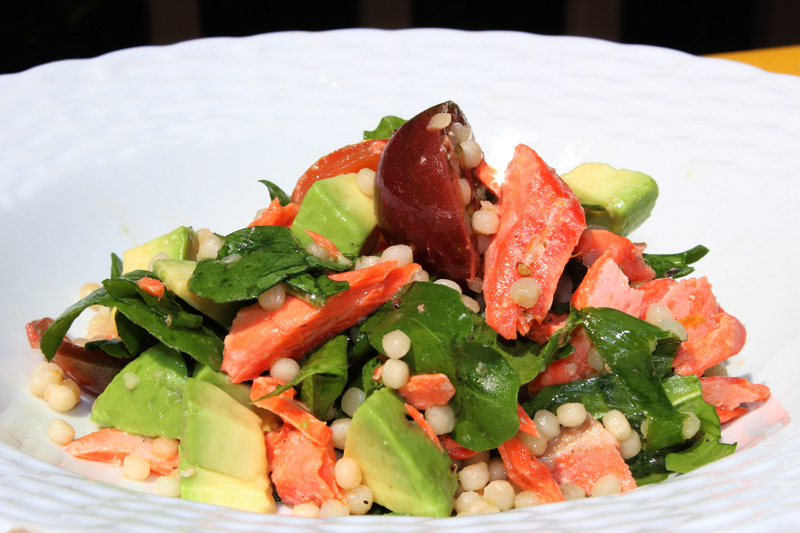 This salad is somewhat of an ode to what I miss about food in the Bay – fish, avocados, spicy arugula and citrus. Because while I may enjoy my pasture raised steak and sun-ripened tomatoes here in Ohio, there are some things that just aren’t quite the same. Cous cous is only tricky if you over think it. The ratio of water to cous cous is always 1:1, simple to remember. That goes for small or large (Israeli) cous cous as I’ve used here. It’s important to shut off the burner once you put the cous cous in and cover it tightly. You have to trust that the steam will cook it, so don’t go checking it every few minutes. Remember that cous cous is a form of pasta and therefore has very little taste. Therefore don’t forget to season it with salt and olive oil while you cook it and make sure it’s fully coated with plenty of sauce or dressing. Citrus zest, as I’ve added here, also adds a nice aroma. If you want to make this salad gluten free, you could definitely substitute the cous cous for baby green lentils or even brown rice. When making salads with a starch built in, like pasta, wheat berry or rice salad, I always assemble my accompanying ingredients first and flavor them well. This way I can add the grains or pasta in gradually to ensure that I’m happy with the ratio. The key to making any grain salad flavorful is acidity. Grains tend to mellow and mute your flavors by soaking up all the liquid. Here I’ve used lime and white balsamic vinegar, but with any grain salad don’t forget your vinegars and citrus. They really help to brighten the flavor. 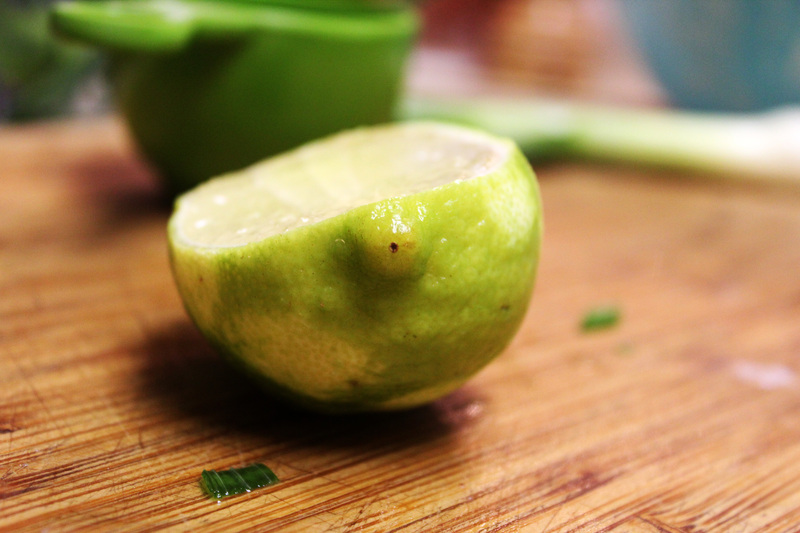 I once learned in a cooking class the best way to cut a lime or lemon to extract the most juice, and I’ve never forgotten it. 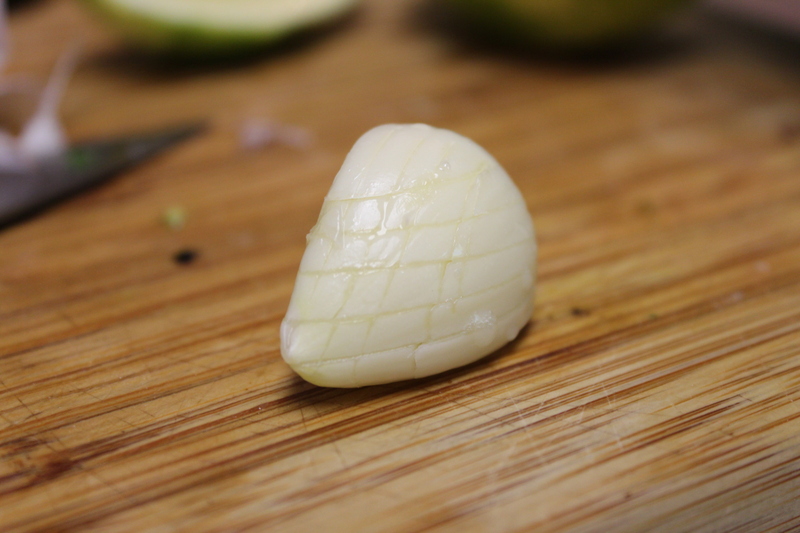 Like the photo below shows, it’s best to cut straight through just off center from the pith. This cuts across multiple sections and allows you to extract the most juice. Plus it’s easy to squeeze. Marinating your salmon in dry spices, salt and olive oil is a nice way to add layers of flavor. I love smoked paprika on salmon, but regular paprika is a good substitute. Herbs de Provence, a blend of marjoram, savory, thyme, rosemary, oregano and lavender, is a blend that I often go to for fish since it encompasses so many wonderful herbacious flavors without any one standing out. It’s also great on Mediterranean chicken dishes and in pasta. 1 avocado, diced right before using to prevent browning. Boil 1.5 cups of water in a medium-sized pot. When it starts to boil, add a pinch of kosher salt and a small glug of olive oil. Then add cous cous, stir quickly, cover and shut off the burner. Leave on the stove covered for about 10 minutes. When it’s cooked, take a fork and flake gently so that the cous cous grains separate. Add zest of one lemon or lime, and some olive oil. Then add a small squeeze of lime. You can leave it uncovered so that it begins to cool as you prepare the rest of the salad. 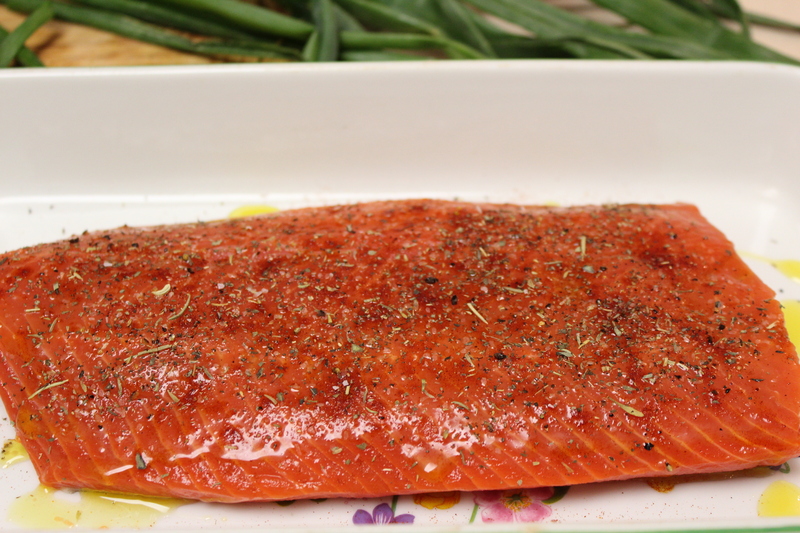 Take your salmon filet and rub it with a think layer of with olive oil. Sprinkle it with smoked paprika, herbs de Provence, salt and pepper. Feel free to use your hands to make sure that it’s spread evenly. Bake on a cookie sheet or casserole dish for about 20 minutes or until fish is firm to the touch. In a large bowl add the greens of two scallions, sliced. Tear two handfuls of arugula or if using baby arugula just toss in whole. Quarter 12-15 cherry tomatoes. 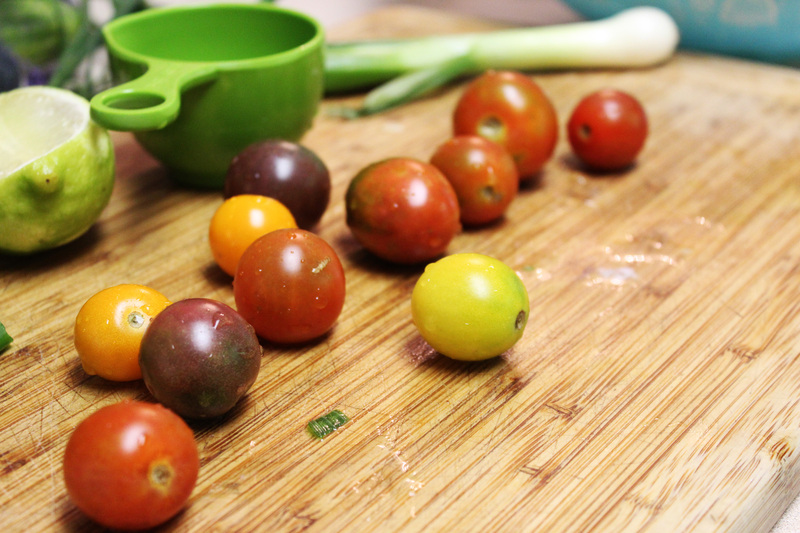 In a bowl, add your minced garlic, white balsamic vinegar and Dijon mustard. Whisk with a fork until blended. Then add olive oil, salt and pepper and whisk again. When the fish is done, take it out and let it rest for 5 minutes. Then turn it upside down and remove the skin and grey flesh right underneath. It should come off pretty easily using a fork or butter knife. With a fork and your fingers, flake the fish, carefully removing any bones that you find. It’s helpful to do this in the same dish that you cooked the fish in help preserve any juices. Add the fish while still warm to the vegetables and toss. Add ½ of the dressing, toss again, then add the cous cous. Once the salad is well mixed, add the remainder of the dressing and lightly toss again, making sure to keep the salmon in large chunks. When you’re ready to serve, add diced avocado. 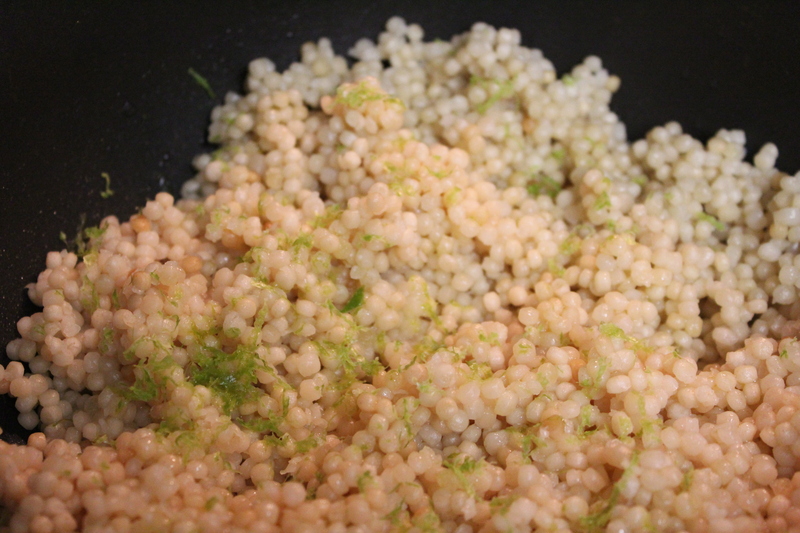 If possible, do not refrigerate before serving as this will hard the cous cous and diminish the flavor of the salad. Can I try the same recipe with scallops? I think you could definitely use scallops with this recipe. Rather than roasting them like the salmon, you might want to sear them on the stove top or in a griddle pan to ensure that they don’t overcook. If you try it, please let me know how it turns out!